Some of the biggest names in the game have forged their reputations at this tournament and I’ve picked out a few “ones to watch” following the opening week’s action. I'd also love to hear who has caught your eye. Any player born on or after January 1, 1990 is eligible to play in the tournament, which is held every two years. While Spain and Netherlands have both looked hugely impressive in the group stage, Italy have also cruised through their opening fixtures. iReport: Are you in Israel at the U21 tournament? The “Azzurrini” have plenty of talent to choose from but it is Napoli’s Lorenzo Insigne who has stood out for me. At 22, with the bad-boy haircut and a whole host of tattoos, the Naples-born starlet looks every inch the part - but where he differs is that he produces. Against England, he ran defenders ragged before popping up with the winner. The ball appears to be tied to his laces, he moves so effortlessly and his awareness is at a different level when it comes to decision making. New Napoli boss Rafa Benitez has inherited an absolute gem in Insigne, who should he continue at this rate of progress, will surely go on to greater things. Another player who has wowed the masses is the mercurial talent that is Isco. Spain’s insistence on its top, young players taking part in this tournament has led to its national side dominating in recent years. It’s hardly a coincidence. Bayern Munich’s Javi Martinez and Chelsea star Juan Mata shone for La Roja at this tournament in 2011. The likes of David De Gea, already a regular with Manchester United, Thiago Alcantara at Barcelona and Athletic Bilbao’s Iker Munian are already household names across Europe. Isco, who shot to prominence during Malaga’s run to the quarterfinals of the Champions League, is seemingly destined to follow coach Manuel Pellegrini to Manchester City before the start of next season. His eye for goal, exquisite first touch and ability to thread passes through the eye of a needle make him one of the most exciting talents in European football. But it’s the performances of Real Sociedad's holding midfielder Asier Illarramendi which has got tongues wagging. His defensive positioning, especially in the opening 1-0 win over Russia, was sublime - as was his passing, which allowed Spain to move from back to front in rapid fashion. By snuffing out attacks and shielding the defense, Illarramendi eased the pressure on his team before taking it upon himself to get Spain moving forward with devastating passing accuracy. At 23, he is already being compared to Barcelona’s Sergio Busquets and, with Sociedad having qualified for next season’s Champions League, don’t be surprised to see a number of “bigger” clubs linked with Illarramendi. The only team which appears ready to challenge the Spanish is the Netherlands, which has also won its first two games of the competition. Midfielders Adam Maher and Leroy Fer have both furthered their cases for big-money moves, while forward Georginio Wijnaldum looks a class act in the making. 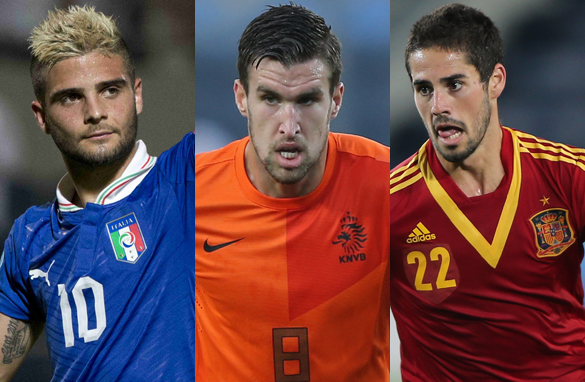 But Manchester United target Kevin Strootman is the one to watch. With 18 senior caps to his name and the captain’s armband, Strootman looks mature beyond his years. At 23, he has progressed from a box-to-box midfielder at Sparta Rotterdam to a deep-lying playmaker at PSV Eindhoven. His vision and passing ability is at a level rarely seen in someone so young and he would easily adapt to the physical nature of the English Premier League. One team which has really flown under the radar is Norway, which trounced England 3-1 in some style. A solid defense and the goalscoring nous of Marcus Pedersen has seen the Norwegians all but qualify for the semifinals. Harmeet Singh, Valon Berisha, Harvard Nordveit are all promising talents, while there is a lot of excitement over 19-year-old winger Havard Nielsen. It’s difficult to see this tournament finishing without a Spain vs. Netherlands final - although Italy, with the likes of Insigne and Marco Verratti could run both countries close. But which players have you enjoyed watching? Who has caught your eye? Make sure you join the discussion below and enjoy the rest of the tournament. As a fan of Arsenal, Stroiotman is the most feasible. Alcantara and Tello have been good, waiting for them to explode in this tournament. Btw, isn't Thiago a little over 21 but is still playing this tournament? Nobody mentioning Ajax Amsterdam's midfield General Erik Christensen – 22 years old????? Although he has not been in any international competition,I should mention his name,FEGUNDEZ. He plays for THE NEW ENGLAND REVOLUTION, AND IS AN GOOD,GOOD PLAYER.Only 18,and has a tremendous talent any where in the field. Klinsmann should take him right away for the National team. Plenty of talents in the Italian league. Hopefully they bring back the league like it was, the greatest ever ! Icardi, El Shaarawy, Balotelli, Pogba, Insigne, De sciglio and more ..
Sure, Actually Israel is an Asian Country. So, definitely Israel plays, Asian Premier Leagues, Israel could bring Soccer-World Cup in Asian Soil, and as far as Greece is concerned, Greece is European Country. JoJo – For you info Israel is not in asia but middle East ! Even their world cup birth is from M.E. Lukaku, Mignolet, Thibaut and Kevin de Bruyne have talent and years on their side. They look very focused, mature and serious. mario goetz. marco ruis!!!!! the 2 best teams in the world are german. its a pity that most english players who would play in this tournament are never allowed by their clubs case in point the ox ,jenkison of arsenal n other players who play for the first 11 for man united,liverpool like rahim sterling or tottenham ensuring that the brightest young players are never given a chance to begin to gell at this stage as compared to the spanish who when they graduate to the first team already know each other.FYI I srael is located in Asia geographically as part of the middle east as it is bounded by jordan,syria,lebanon who are all in asia but in football they play under UEFA which is quite odd but understandable due to its history with its neighbours this is similar to australia who migrated from oceania to qualify under the asian qualifiers. Israel is located in the Middle East which is part of Asia. However, since 1991, they have played in UEFA (Europe). Their one world cup birth was from the AFC (Asia) but that was in 1970. By 1974, they had switched to the OFC (Oceania), as they were expelled from the AFC (for political-religious reasons?). So, yes, they are an Asian country located in the Western Asian region referred to as the Middle East. However, they participate in UEFA alongside teams such as Germany, Greece, Russia, France, etc. Andik vermansyah is so eligible...he can be equalized with isco, ni mar, or other star player in thw world..
Cong Vinh (Vietnammese) is best!